For today's busy woman, organizer purses help keep essential items at your fingertips. The key to finding the right organizational handbag is knowing what features you need and what your organizing style is. Several brands offer organizer purses. Whether you want a simple way to organize your credit cards or you need many pockets and compartments for all your belongings, you'll find a bag to suit your needs. The Baggallini brand was created by flight attendants who knew how important organization can be. The brand has a wide range of handbag designs with excellent organizational features ranging in style from mini bags to totes and crossbody styles. The Oslo Small Hobo Shoulder Bag is more than a sophisticated-looking purse. It has plenty of features to keep you organized, including four hidden interior pockets, a special cell-phone compartment just behind the clasp, and an adjustable strap that can be used across the body or on the shoulder. Choose from six colors (grape, black, charcoal, portobello, scarlet cheetah, and black basket weave) in this structured hobo bag, each set off with gold-tone hardware, for about $80.00. The Triple Zip Bagg is stylish and affordable. Available at just under $50.00, this small shoulder bag still keeps you very organized with its three separate zippered compartments. It also has a secure interior credit card slot and a lipstick pouch. 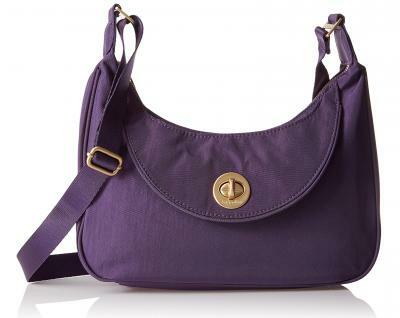 The convertible strap allows you to use it as a shoulder bag, crossbody bag, or waist pouch. It's available in red, charcoal, beach (tan), and java. The Derek Alexander brand offers a selection of simple and functional organizer purses done in high quality leather. 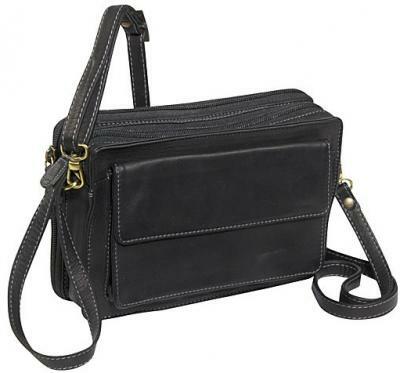 The black leather Double Zip Organizer Handbag features a large zippered interior compartment with 12 credit card slots. It also has three exterior pockets that zip - two on the front and one on the back. The shoulder strap is adjustable, so you can use it with a short shoulder strap or extend the strap to wear it as a crossbody style. It costs around $160.00. Reviews on eBags are overwhelmingly positive, with one customer describing it as "perfect in every way." The EW Top Zip Organizer is divided into two zipper compartments. One of the compartments is open to store larger items and the other is divided for maximum organizing capabilities. The divided compartment has ten slots for credit cards, three drop pockets, a slide pocket and a pen holder. This leather bag comes in black, brown and tan. It costs around $215.00. Customer reviews on eBags are largely positive, with one describing the bag as "small enough to carry easily yet large enough to carry the essentials." Levenger has an extensive selection of high-quality leather organizer handbags, each of which is designed to look great while providing sufficient space to carry and organize multiple items. Levenger's Marley Crossbody style has a gusseted pocket on the front that has two zipper storage areas inside it as well as an open pocket, a loop for a pen and slots to hold up to five credit cards. Its main compartment is large enough to hold a tablet the size of an iPad mini and it has a pocket that zips closed, two additional pockets, two loops to hold pens in place, and a key fob. It comes in black, brown and plum leather with nickel hardware. It has an adjustable shoulder strap. This bag costs around $175. Reviews posted on the Levenger site are very positive, with one customer pointing out that you don't even need a wallet with this purse. 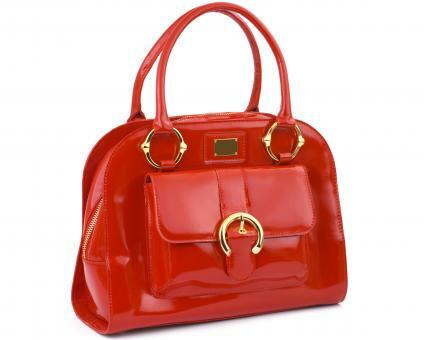 The leather Sydney Satchel is a great option for women who like bags with flap closures. Under this bag's flap, you'll find a bag spacious enough for a laptop, two slip pockets, a pen holder, and an interior secure pocket and key fob. On the outside, there are six exterior pockets. The shoulder strap is adjustable and removable. It comes in black or ash leather with gold-tone hardware and is priced at about $350.00. Anuschka offers colorful hand-painted leather designs. The line includes several styles designed specifically as organizer bags. The brand's purses consistently get 5-star reviews on Amazon, and they are praised for both their beautiful style and organization. 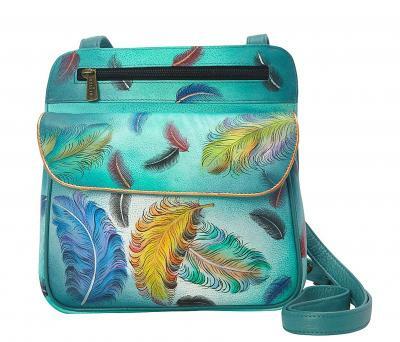 Anuschka's Multi Pocket Crossbody Bag, available for under $100.00, is eye-catching based on its beautiful floating feather design alone, but the organizational features reveal even more to love. It includes a front pocket with magnetic closure and a front zippered pocket. On the inside, there is an inner multipurpose compartment, and a zippered wall pocket. A rear zippered pocket and slip-in cell phone pocket complete the bag. 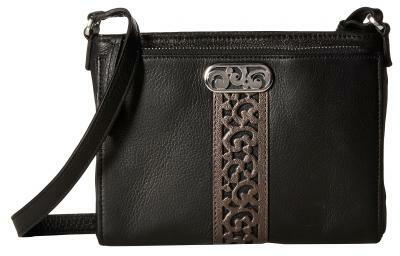 The Triple Compartment Crossbody Bag is perfect for the woman on the go. The three separate top compartments open with zippers, and there are two snap-closure pockets in the middle. There are also plenty of other pockets: interior slip wall pockets, an exterior zippered rear pocket inside, cell phone pocket, and a removable ID holder. This style costs about $220.00 and is available in Floral Fantasy or Spring Passion. Brighton purses are based on a combination of timeless designs, attention to detail, and the sourcing of the finest materials in the world. The Contempo City Organizer is on the smaller side, but it still has a front organizer section with five card slots, ID window, pen holder, and multifunctional pockets. It's made from genuine leather and features an adjustable shoulder strap. Expect to pay around $250.00. The Moreneta Organizer Handbag (around $450.00) is perfect when you need something dressy that will also keep all your things organized. The top closes with a magnetic flap and there are four pockets inside. There's a phone pocket, two lipstick pockets, eight credit card slots, and a removable mirror, and the outside is leather while the interior is polyester. You can choose whether to carry it by the handle on top or use the adjustable, removable shoulder strap. eBags carries many different brands and styles of organizer bags, which can be filtered by brand, color, material and more. Shoebuy has hundreds of handbags designed to help organize your life on-the-go, ranging in style and priced for both the discount and luxury shoppers. Zappos has an excellent selection of organizer handbags and purse organizers in a variety of sizes and price points. While you may find similar features amongst handbag choices, you aren't limited to a short list of styles. A built-in wallet or slots for credit cards, cash, etc. Despite having similar features, using an organizer handbag doesn't mean being restricted to matronly styles and bland designs. There are dozens of creative designs, colors, sizes, and materials - everything from fun and flirty discount bags to sleek and streamlined designer purses. Embroidered clutches, mini denim backpacks, nylon messenger bags, croc-style cargo satchels and even Italian leather hobo styles are designed with organizational features. Structured styles are popular, but organizing features are also available in some less structured bags. Unstructured, slouchy and soft-sided bags are more difficult to find as organizers, however, since their more structured counterparts are easier to divide and compartmentalize. Choosing organizer purses, like any accessory or clothing item, is an adventure in finding that delicate balance between fashion and function, your needs and your personal style. Choosing your purse also depends on what kind of organizational style you have. Are you a perfectionist? You may want to look for highly structured, streamlined, medium-size bags with lots of slots and zippered pockets to keep everything in place. The Buxton Bag might be perfect for you. Are you a packer? Look for large bags or totes with various sized compartments to hold extra items like hand sanitizer, extra credit cards, pad of paper, bandages, and address book so these things aren't crammed into a small space and jumbled together. A large insert organizer, such as the Pursket, will allow you to turn your hobo bag into an organized handbag haven. Are you a dumper? Do you try to keep organized but have a tendency to just throw things in your purse? Look for medium-sized bags with open slots, snap or elasticized pockets, and elastic loops so you can easily slip items into your purse without too much effort and still be organized. Anuschka offers several larger organizer bags. The durable leather will hold up to things being tossed inside. Are you a de-clutterer? Do you constantly throw things out of your purse and carry only the minimum you need? Look for small or mini bags or travel clutches with attached wallets and coin purses to keep your items neat and easy to reach. A smaller Derek Alexander or Butler Bag might be perfect for you. Whether you choose an organizer bag with built-in features or add an insert organizer to an existing bag, having your essentials neat and orderly saves time and frustration. With the many styles available, there's no need to sacrifice great style for organization.